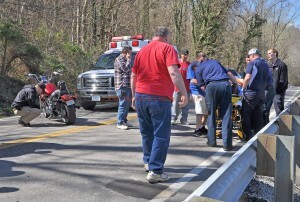 A Vanceburg man was injured Wednesday afternoon when a reported gust of wind caused the motorcycle he was operating to go out of control and crash. Deputy Eric Poynter said the accident happened about 12:15 p.m. Wednesday as Bradley Sparks Jr., 21, of Vanceburg, was traveling west on Ky. Rt. 8, just east of Vanceburg. Poynter said a strong gust of wind reportedly caused Sparks to lose his balance, and the 19978 Honda Shadow motorcycle to go out of control.